In 2003, the Chicago Cubs were five outs away from the World Series. They had not been so close for so long. As the anticipation grew, a seemingly small opportunity that slipped away opened the floodgates to disaster. 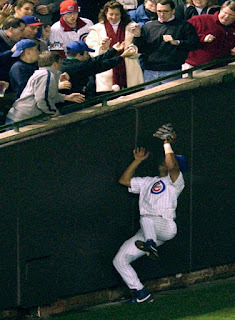 A ball that might have been caught, even though near the seats, was not caught because Cubs fan Steve Bartman was in the way. A few minutes later, the Florida Marlins scored enough runs to win the game, advance to the World Series, and beat the New York Yankees. 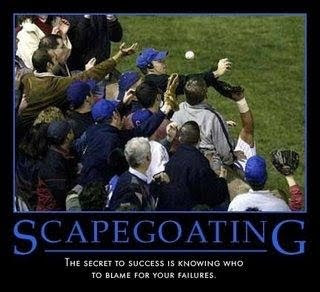 Cub fans to this day remember the missed opportunity as a turning point that turned victory in defeat. In 2005, the Chicago White Sox were two outs away from the World Series Championship. At the other team's ballpark, a fly ball in the stands was caught by shortstop Juan Uribe by reaching into a group of Houston fans. A few minutes after that, the Sox were champions for the first time since before World War I. What we learn from these two sports moments is to be diligently and alert, not taking anything for granted. For us, in anticipation of moving into a much improved home situation, we're careful to go to antique malls and look for bargains instead of credit card abuse for the lights and furniture we need. Playing with a lead, just like a life that is going very well, still requires vigilance and attention to detail. In the meantime, rejoice and celebrate God's abundant blessings. Deuteronomy 6:10 - 12: And when the LORD your God brings you into the land that he swore to your fathers, to Abraham, to Isaac, and to Jacob, to give you - with great and good cities that you did not build, and houses full of all good things that you did not fill, and cisterns that you did not dig, and vineywards and olive trees that you did not plant - and when you eat and are full, then take care lest you forget the LORD, who brought you out of the land of Egypt, out of the house of slavery.